Experience the Unique and Varied Global Fusion Style of The Gnomes: a World-Wide Musical Smorgasbord! : Saturday, June 5th @ 8:00 p.m. The Gnomes highly eclectic music style has been characterized as a rather unique brand of “world fusion folk”. Their ethnically varied output consists of both originally composed and arranged compositions into which have been artfully incorporated elements of Celtic, Klezmer, Scandinavian, Caribbean, Asian, and Latin folk genres. Collectively, the membership of the band brings a vast and varied range of global music experience to the group as a whole, making it easy to see why they have become so successful together as a world fusion ensemble. Fiddler Cathy Jasper Torch picked up the erhu (Chinese fiddle) while living in China as a teenager. Phil Edmonds hales originally from Killaloe Co. Claire where he acquired his artistic skills on Irish tin whistle and button accordion. Bassist and singer Peter Breen lived for four years on the island of St. Maartin and once performed with the Blue Roots Reggae Band. Otis Read, a late 90s resident of Umbra, Italy is currently active as a performer, composer, and producer. Ron Schmidt has performed, composed and recorded with a number of dance and world music ensembles. 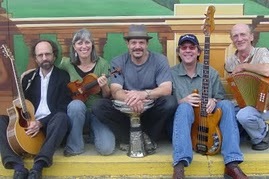 The Gnomes are the proud recipients of the 2008 Motif Magazine Music Award for Folk /World Performance. Their cd entitled Everybody Must Get Gnomed presents a classic example of their highly ethnically varied fusion style as it includes many different genre forms such as: tangos, tarantulas, polkas, flamenco, Scandinavian waltzes, Sephardic hymns, Hasidic melodies, and Irish folk dance music. You can listen to it here. Come take a musically creative and intriguing trip around the world with The Gnomes. When: June 5th – Saturday @ 8:00 p.m.